This is a very exciting thing for the Museum. We realize there are so many people that do martial arts across the world and most of them will never have the opportunity to visit the Museum all the way here in Burbank, CA. So, we are doing the next best thing; bringing the Museum to you! 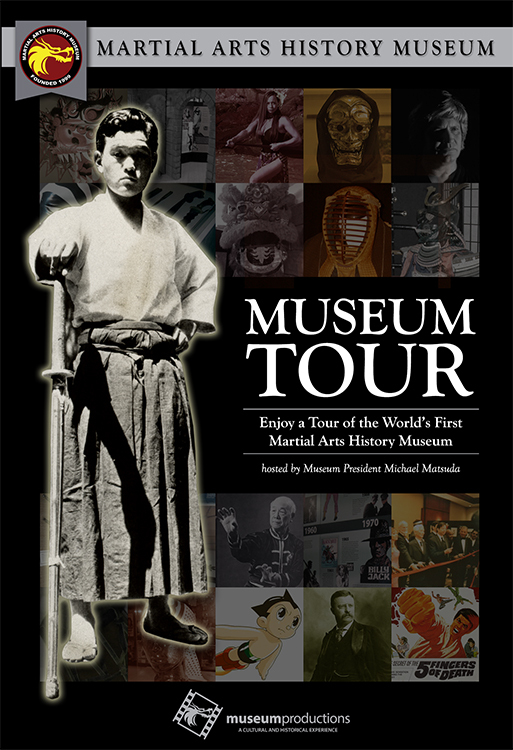 Now available, we have just finished creating a 1 hour and 10 min tour of the Martial Arts History Museum hosted by Museum President Michael Matsuda. He will explain all the ins and outs of the Museum and take you through every section of the Museum. Now, we never provide Museum tours to our visitors, just groups when they sign up in advance. So, this is something the average person doesn’t get. Most tours we provide are just 30 minutes, but we want you to enjoy the beauty of the Museum, get a wonderful history lesson (especially if you are doing a book report), and through this, it will support the Museum. Orders outside the U.S. will be charged an additional mailing fee. We will notify you of the costs before we ship the dvd to you.